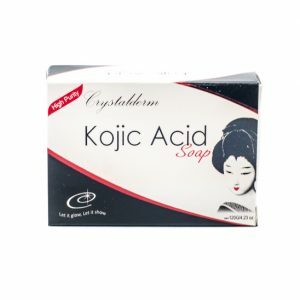 Crystalderm Kojic Acid contains high grade kojic acid. It whitens and clarifies the skin fast to keep it smooth and glowing. 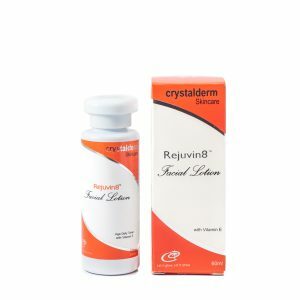 Crystalderm contains pure and high grade Kojic acid. 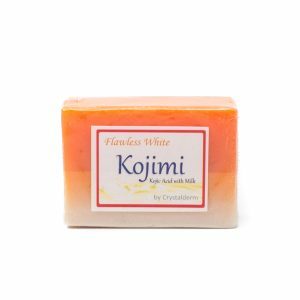 Kojic acid is derived from a variety of fungi and organic substances and is present in skin-whitening soaps used to diminish dark areas resulting from excessive pigmentation in the skin. Besides freckles and melasma there are many types of pigmentation problems that may be treated with kojic acid, because it stops the production of pigment. Kojic acid attacks the root of the pigmentation source by inhibiting the production of melanin. More specifically, kojic acid counters the antioxidant properties of the enzyme tyrosinase, which reacts with an amino acid called tyrosine to produce melanin. By stopping the production of melanin, kojic acid can reverse excessive darkening of the skin and promote a younger and fairer complexion. 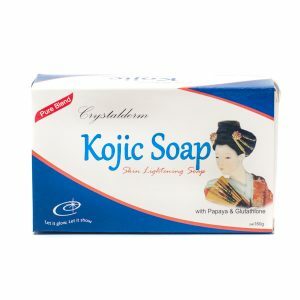 Kojic Papaya Soap with a powerful combination of kojic acid and natural papaya extract is an effective cleansing product that is intended to diminish dark areas, eliminate melasma and freckles, remove pimples and lighten the skin. 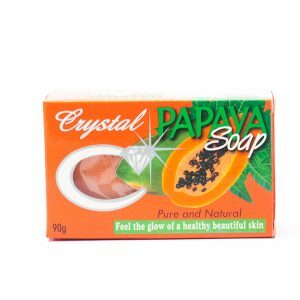 This soap is also proven to rejuvenate and smoothen the skin by holding back the formation of melanin. 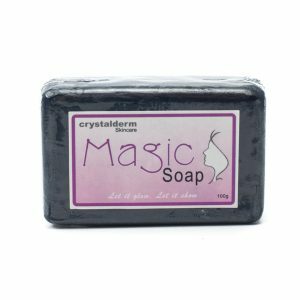 Crystalderm Magic Soap helps smoothen and lighten your skin. Feel the glow of a radiant beautiful skin with regular use. 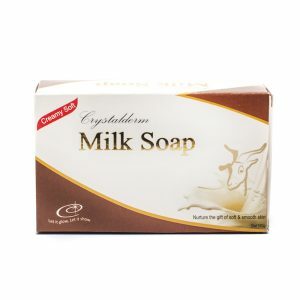 Moisture-rich Crystalderm Milk Soap nourishes your skin with nutrients, vitamins, and minerals from natural milk proteins. It cleanses, moisturizes, and protects skin. 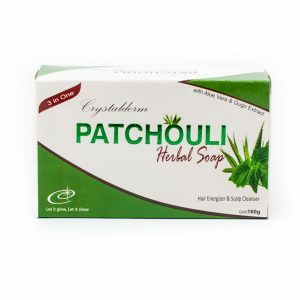 It is gentle on your skin and creates a soft and creamy feel after each bath. 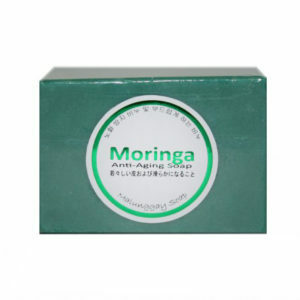 With its natural and pure Malunggay Leaf Extracts it keeps your skin smooth, firm and younger looking. 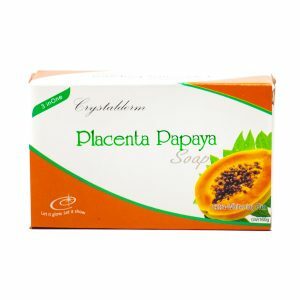 Crystalderm Placenta-Papaya is a luxurious blend of 3 in1 natural ingredients designed to improve skin texture and keep it whiter and moisturized. With beta-H microprotein from botanical placenta, pure and natural papaya enzymes plus high-grade virgin coconut oil, it revitalizes the skin and and keeps it fair and glowing. 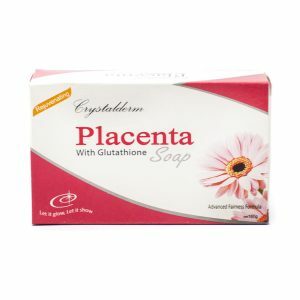 Crystalderm Placenta with Glutathione Soap contains pure botanical placenta extract and powerful glutathione, a natural antioxidant, that helps improve skin texture, enhances skin elasticity and promotes whiter and youthful skin. 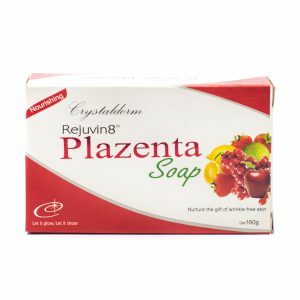 Crystalderm Rejuvin8 Plazenta Soap is especially formulated with botanical placenta extracts and multi-vitamins from natural and organic fruit extracts that helps deep cleanse, rejuvenate and nourish your skin. Regular use promotes a smooth and youthful looking skin. 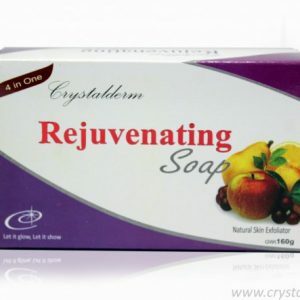 Crystalderm Rejuvenating Soap contains natural fruit extracts that provides your skin with essential vitamins A,C & E and B5. Infused with revitalizing fruit acids, it helps facilitate skin renewal, promote deep cleansing, skin whitening and rehydration. Nurture the gift of fair and smooth skin. 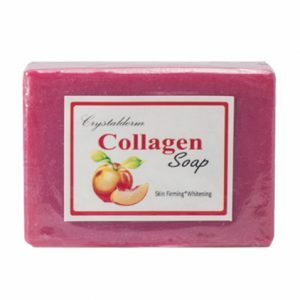 Crystalderm Collagen Soap contains Hydrolyzed Collagen and natural fruit extracts that help make your skin tight and healthy for a younger looking skin. 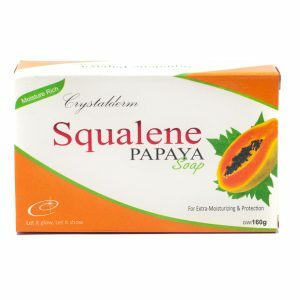 Crystalderm Squalene-Papaya Soap is blended with squalene oil and natural papaya extracts. It gently cleanses, relieves sun damaged skin and helps retain moisture leaving your skin fresh, smooth and younger-looking. Nurture the gift of fair and smooth skin.